We are often told we must take up our crosses. It is true, we must. But today, on the feast of the exaltation of the cross, we celebrate that the cross also takes us up, that it bears us up, that it lifts us up, even ultimately to heaven. What is that thing that you suffer from most, your heaviest cross today? Thank God for it. Touch your lips to it, as surely as we kiss the cross of Christ on Good Friday, because it is a participation in his cross. We thank God for our crosses because they have redemptive power. Here’s an example. Stephen Colbert recently talked about how he lost his brother and father when he was only three. He spoke about how that his carrying that cross has made him better, made him closer to the Lord and his family. He said: “It’s that I love the thing that I wish most had not happened.” That’s the case for Christ, too, and for us. 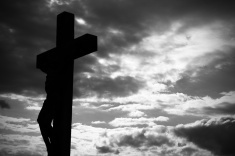 We thank God for the cross, that thing we ought to hate the most, because by it we are saved.